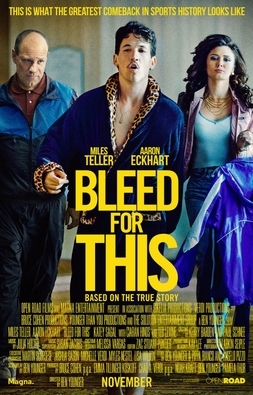 ‘Bleed for This’, the latest entry in a seeming conveyor belt of boxing movies, is the story of Vinny ‘Paz’ Pazienza, a world champion boxer at different weight levels who overcame a horrendous injury to return to the ring. It’s an extraordinary and inspirational story, but it’s depicted in an ordinary film that feels like its many beats are borrowed from previous and better films in the genre. That being said I’m a massive fan of boxing movies and I enjoyed ‘Bleed for This’ as it moved through every cliché in the book and I was rooting for Paz throughout the film’s runtime. This can be partly attributed to the higher than expected performance levels, firstly from Miles Teller in the leading role but also spreading out across the supporting cast. Teller’s had an interesting career to date, crossing over from juvenile comedies to some heavyweight material that’s really stretched him (such as 2015’s best film, ‘Whiplash’) and he’s very good again here throughout. He encapsulates the fire in the belly of the character to come back from adversity, both successfully showcasing the anguish and despair he faces then brilliantly depicting the determination to fight back and return to the ring. Despite this great display, the plaudits are likely to bypass him somewhat once again (as they did for J.K. Simmons in ‘Whiplash’) and centre on Aaron Eckhart’s transformation into alcoholic boxing trainer Kevin Rooney (who also worked with Mike Tyson in the past) and it’s not difficult to see why. It would be easy to fixate on the physical changes Eckhart’s made (which seem more pronounced having watched this straight after ‘Sully’! ), with a receding hairline and a significant weight gain, but his actual performance is excellent both from a dramatic and comedic perspective. He adds a lot of humour to proceedings but he also nails the dramatic elements and the dynamic between Eckhart and Teller elevates the material beyond its solid groundings, whilst I also liked Ciaran Hinds hammy turn as Paz’s father. One of the strengths of recent boxing movies has been the directing of the fight scenes, but that’s unfortunately a weakness in ‘Bleed for This’ in my opinion with the scenes often shot in a strange close up with choppy editing, making it hard to follow what was happening. Whether you know the history or not, fights in boxing films are generally easy to work out what’s going to happen so the key is to inject some suspense or tension into the sequences and I felt ‘Bleed for This’ disappointed in this regard. ‘Bleed for This’ is a solid boxing film that nevertheless follows a standard template, relying on the excellent performances and the origins of its story to elevate the material, and on that basis I did really enjoy it.